What are the standard dimensions of a washing machine? Actual dimensions will be determined by the type of washing machine and every manufacturer will have its own specifications for particular washer. While some front load units are made according to standards of kitchen cabinets and might be used as a build–in option, many washers are free standing and exact dimensions determined solely by the manufacturer. First row for every washer type is imperial units – washing machine dimensions in inches, capacity in cubic feet. Second row is a metric system – washer width, height and depth in centimeters, capacity in liters. Laundry centers or unitized spacemakers washer and drier assembled together and dimensions of a whole unit provided. Separate dryers usually made same sizes as washing machines and in many cases manufacturer offer the gas or electric dryer to match with exterior dimensions of the front or top load washer. Capacity of the dryer typically higher than the washer allowing the air circulate better inside and dry the cloth more effectively per each load. Usually capacity varies from 3.5 to 7.5 cubic feet (99 – 212 liters). Washer/dryer combination typically 24 or 27 inches wide 29 3/4” – 33 1/2” high and 22 7/8 – 33 1/2” deep. Stackable washer/dryer has equal width and depth in order to allow usually the dryer to fit proportionally over the washer. Compact 18”W x 30”H x 17”D top load washer will weigh about 45 lbs (20 kg). Bigger 4.6 cubic feet capacity and 45 inches high washing machines might weight as much as 150 – 180 pounds (68 – 82 kilograms). 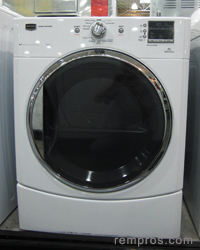 Laundry centers much heavier and one unit typically range from 220 lbs (100 kg) to 260 lbs (118 kg). If net weight stated in specification shipping weight will be always higher. Some washing machine might be plugged in regular 110 volt electric outlet, some will require higher voltage and 220 – 240 volt electric outlet has to be installed prior to connecting the washer or dryer. Wash load is parameter which determine the weight of dry cloth can be washed per each cycle. Manufacturer provides it as a maximum capacity for specific washing machine. Depending on washer size wash load vary from 3.5 to 11 kg (7.7 – 24.3 lb) per one cycle.